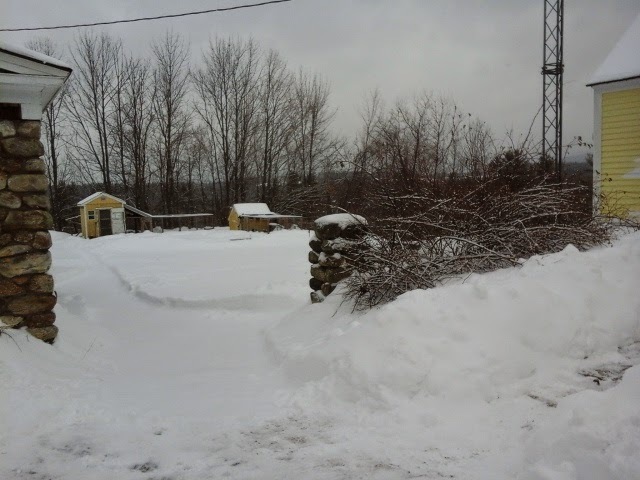 When it looks like this outside, the chickens will be spending most of their time in the coop or run. Where chickens spend alot of time hanging out, they also generate lots of poop. Especially under the roosting area. All that poop can make your coop smell pretty unpleasant, but even more importantly, can be unheathy for the hens. The ammonia gasses given off from the uric acid in their poop are not good for them to breathe constantly, and it does not take long for a closed up coop with even a few hens to build up these fumes. Just another reason against the factory farming style of raising chickens... they are crowded by the tens of thousands in filthy darkened warehouses on floors covered in excrement, and dead birds, and these warehouses are not even cleaned between the batches of chickens. chickens raised this way have been shown to have lung lesions from the fumes. Thats the chicken on your grocery store shelves. Just sayin'. 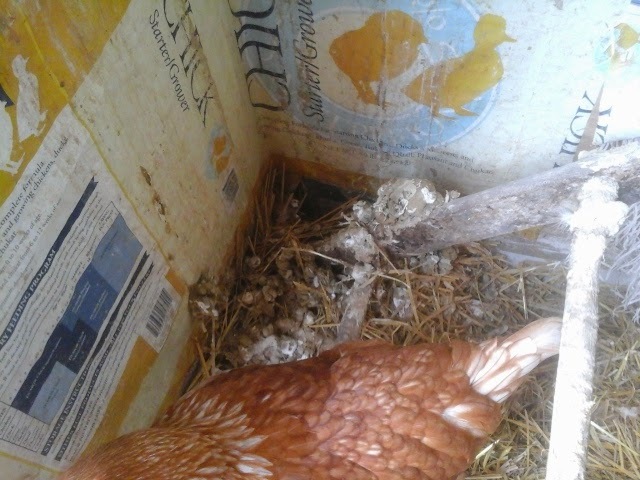 A properly cared for chicken coop should not smell. So, what to do? 1. Rake out the poop every day or two, and completely replace the bedding underneath. This is labor intensive, and expensive, if you are buying wood shavings and straw. 2. utilize the deep bedding method. This is my preferred method, for several reasons. But first, what is deep bedding? 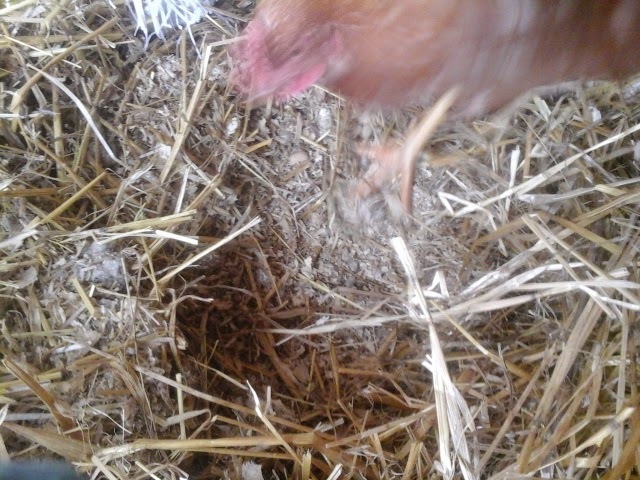 It is, as the name implies, a thick layer of bedding material in the floor of the coop. It could be pine shavings, sawdust, straw, dead leaves, or even finely shredded newspaper. Anthing that is compostable, and absorbent. Deep bedding will absorb the moisture from poop, and thus alot of the odor, will prevent the hens from walking on piles of poop constantly and thus cleaner for them and helpful to prevent feet infections, plus, at the end of winter, you will have some primo compost for the garden. 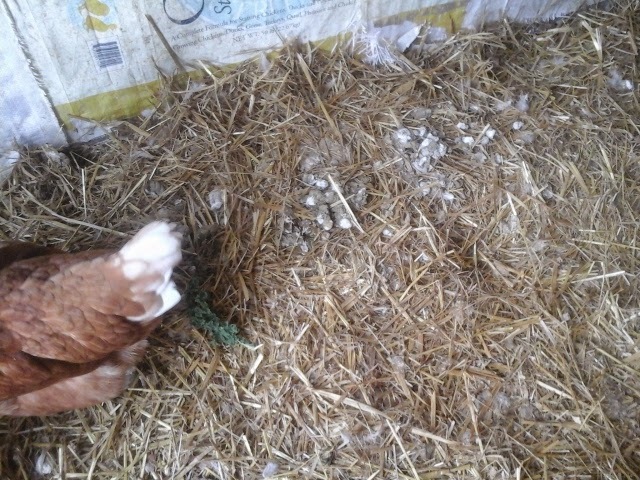 Deep bedding also helps insulate the coop from winter cold. my coop is off the ground with a wood floor, but this works for dirt floors too. In that case, a layer of sand might be helpful to start. First, spread a layer of sawdust or pine shavings. On top of this, add an inch or two of whatever you are using as bedding. I use straw. When the poop starts to pile up, take a rake or hay fork and turn the dirty litter over. add new clean bedding on top. the bottom layers will begin to compost as time goes by. Can you see the finer material underneath? It is already composting, making some great mulch amd fertilizer for the garden. The chicken's natural scratching and pecking aid in tjis process. 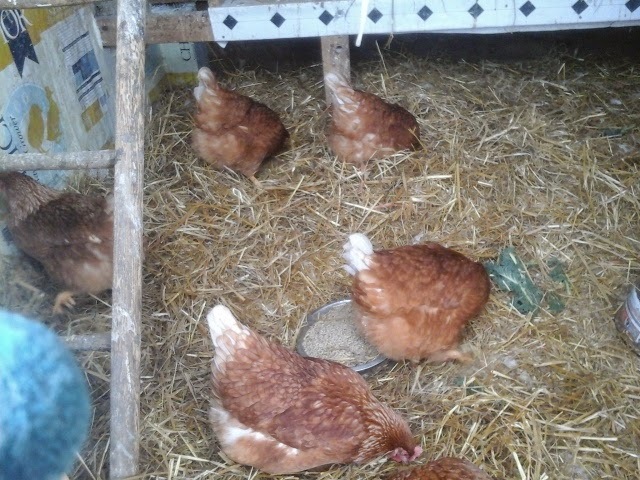 By winter's end, you will have a thick layer of bedding, usable for the garden, and happy, healthy hens. Here they are scratching around in the new straw looking for seeds or other tidbits. Weather : cold! It was minus 8 this morning, and hasnt gotten out of the teens all day.the chickens had to stay inside but they got nice clean bedding and some kale leaves as a treat. Nice and interesting facts. Love your knowledge in so many areas. I am well versed in chicken poop. Maybe not so many other things! LOL.